After two months of city dwelling, it felt wonderful to get back into the great outdoors. Our destination was Rocky Mountain National Park. I booked us into the Glacier Basin Campground located within the National Park and it did not disappoint. Most National Park Campground facilities were developed long before today’s RV’s were even a glimmer in granddad’s eyes. 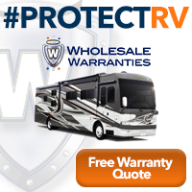 Thus, when it comes to campsites size does matter 😉 Being wise to this tidbit of knowledge played a very important role in our RV buying decision. 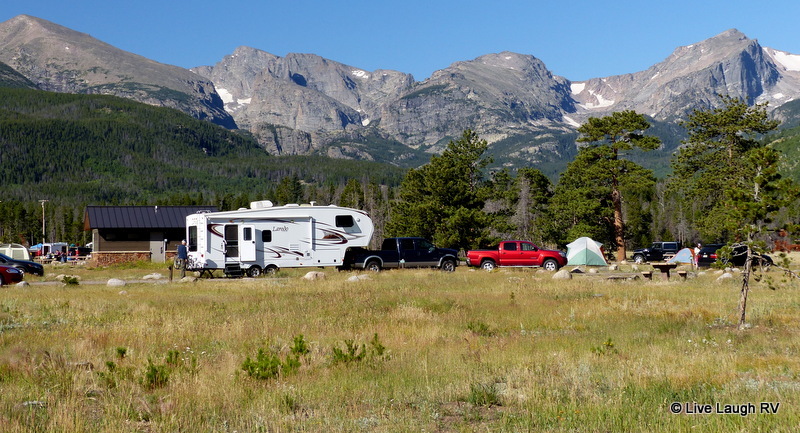 We didn’t want a RV that would be too big to fit into some of these National Park campgrounds. However that said, before making a reservation we wanted to lay eyes on the campgrounds and pick out specific sites. 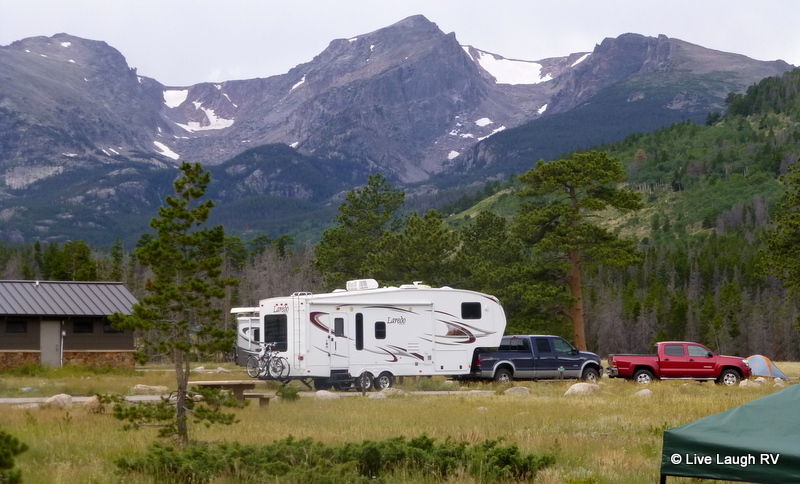 We took a scouting day trip to Rocky Mountain National Park from Denver to check out the camping facilities and see which sites would accommodate our size, and of course which ones had awesome views. With our modest 31 foot length, we realized we might fit into less than half the campsites. Most of the sites are really geared toward tenting. We did manage to score a nice site with an unbelievably gorgeous view. We initially thought about leaving my little truck parked at our daughters place in Denver, but at the last minute decided to take it along for our day excursions. The Tacoma is a lot easier to park than the F-250 with extended bed and this was still August after all; peak tourist season, meaning parking would be a challenge. Our first full day found us bounding out of bed at 6:00 a.m. and out the door thirty minutes later. Al was none to happy with me and didn’t understand my urgency. 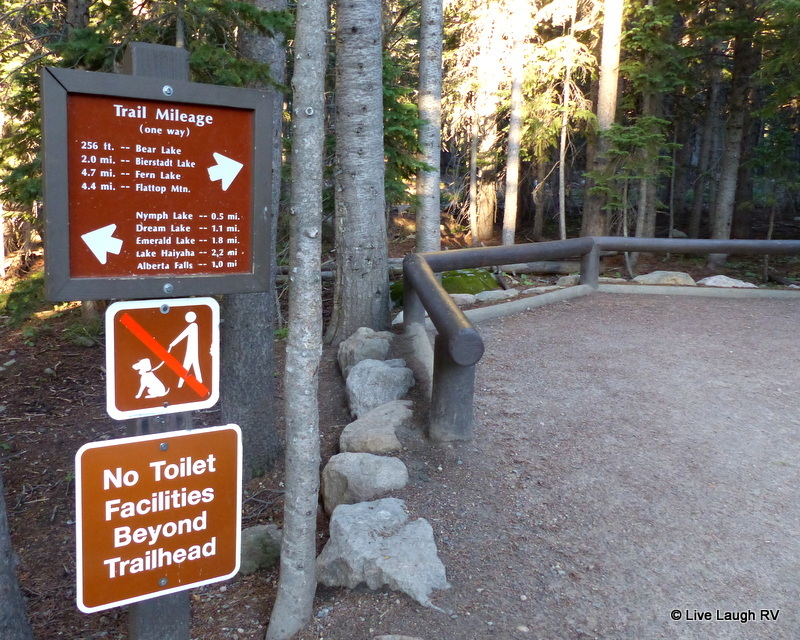 Hubby suffers from a severe case of selective hearing and as many times as I briefed him that we would be hiking thee most popular trail in all of Rocky Mountain National Park, he didn’t seem to comprehend what that meant. We arrived at the Bear Lake trailhead parking lot with the place already a third full with cars. Yep, I was sure glad I was driving the little truck; much easier to park. I knew I was too late to capture a sunrise over Dream Lake, but apparently plenty of other hikers and photographers were not. Since this was our first day hiking, we felt a slow and short hike was in order to allow ourselves to acclimate to the 9,500 foot elevation. Many years ago, I experienced altitude sickness and Al and I wanted to make sure it didn’t happen again…. although I was a flatlander back then! We hiked around Bear Lake twice then headed UP the trail to Nymph Lake. We took our time taking in the beauty before returning to the trailhead around 8:30 a.m. Upon our return to the parking lot, we noticed orange vest clad workers directing traffic. The lot was already full and as early bird hikers were leaving waiting cars were directed to the newly vacated spot. Al couldn’t believe the traffic. And of course I couldn’t resist saying, “Told ya so!” Weekends are especially busy in Rocky Mountain National Park, which is understandable considering it’s only about a 75 mile drive from Denver. The campground was full on the weekend and only half full during the week. 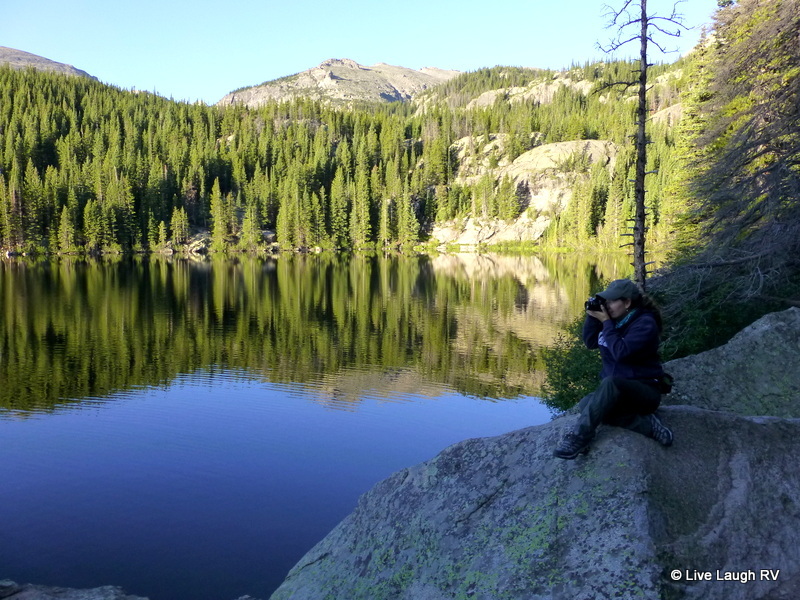 This was just the beginning of our wonderful stay in Rocky Mountain National Park. 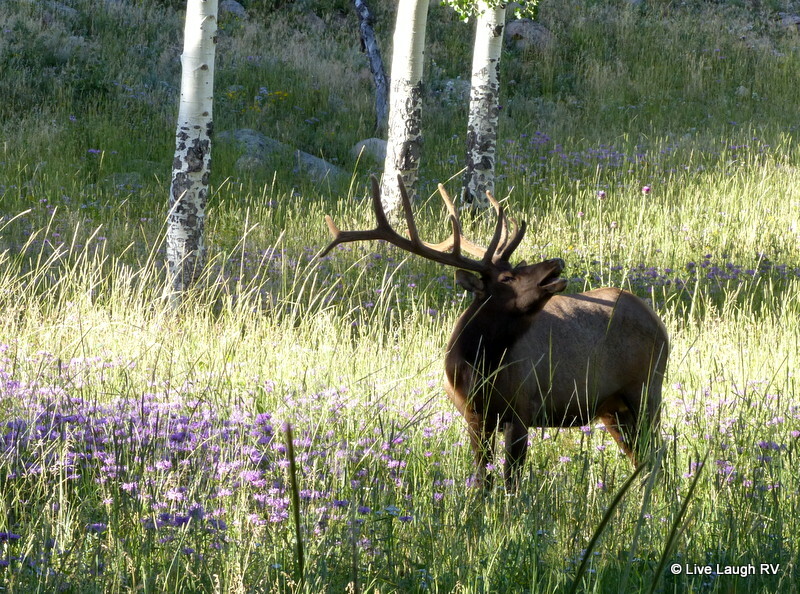 Beautiful photos of your trip to Rocky Mountain NP. Looks like the monsoons are over and the sun came out for you. Those Rocky Mountain pics are giving me some serious reasons to do some trip-planning! I stopped over here (at the blog, I mean) last night, Ingrid, and did some long-awaited catching up with your July and August. 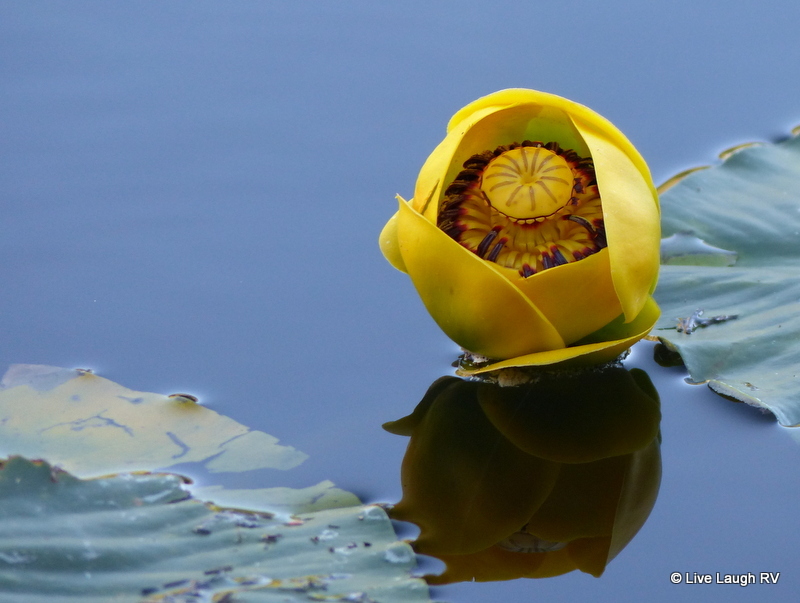 It looked like lots of fun and good times with the kids, and the Chihuly(s) in the botanic garden – wow! Anyway – delighted to get your new post today! It’s been soooo long ago that we did Rocky Mt. Nat’l Park…long before we had an RV…I envy you two that beautiful spot and the hiking to Bear Lake. I have a photo of Dennis standing by Bear Lake…looking about 42 years old at the time. Don’t know if you have ever done Yellowstone or Glacier. Not sure about RVing in either. It’s been ages since we were there too..but both are well worth the trip!!! Thank you Sylvia. Turns out that early start was a must. By noon there was no place for anyone to park and a scrolling, lighted construction sign placed along the road told visitors to turn around and come back after 3:00. Crazy busy on Saturdays! absolutely lovely – thank you for the vacation in my mind.. I am relying on you to give me snipppets of the west and beauty for the next month or so.. have a great week – school is back in session. Thanks for the tour. I sure hope our estimated time of arrival there is around the first of October is not too late. I know snow can come early there. Crossing our fingers and toes. It’ll be cold and hopefully the trees will still have plenty of leaves at the higher elevation. The up side is you won’t be battling any crowds – enjoy. Now I’m REALLY bummed about spending my summer on the sidelines (my porch). One of our many favorite parks! We visited at the beginning of June which was nice because we beat the big crowd and most of the trails had opened. But even then, many trailheads were crowded early. 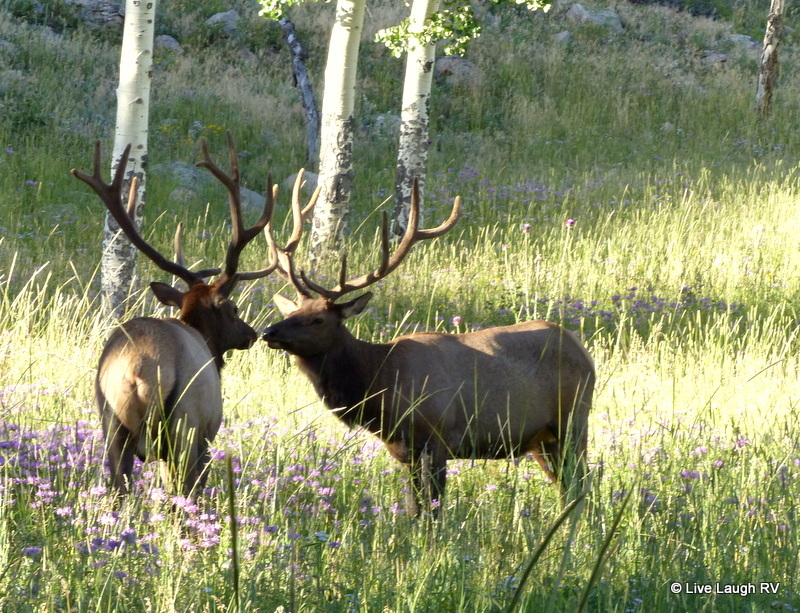 I love how prevalent the bull elk are in the park. I love those antlers!! What a beautiful spot. Why did you leave? Trust me, if they would’ve let me stay longer I would have. Now I’m trying to figure out a way to go back for fall colors and the Elk rut. Doubtful with some of our obligations. Thank you and trust me when I say, ‘the list only gets longer’. We’re thinking of a Mackinac and Sleeping Bear Dune visit next summer, but I’m not sure if I can pull myself away from Colorado LOL. 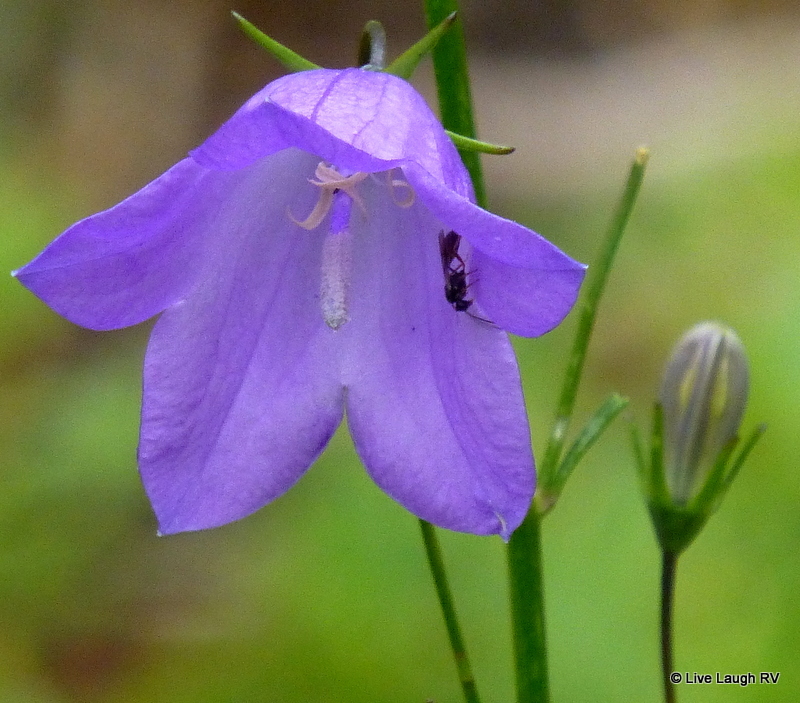 Love Your Captures – Wildlife, Floral and Nature – Oh My 🙂 Happy Day – you made my day and boosted my mood – thanks so much! Just another day in paradise! Its the opposite in our household, when it comes to getting up and out early, Steve is the taskmaster! Stunning photography, you got it good, Ingrid! What an amazing place to call home, even if it is “only” temporary. Magnificent photos. Thank you so much for taking us along, Ingrid! Hiking at the 9,500 foot elevation, Wow! Score on the campsite…and score again on those shots! I particularly like the one of you on the rock by the lake. Beautiful perspective. Beautiful! Great pics! I would love to explore that area! What a gorgeous view! I really enjoy your photos. 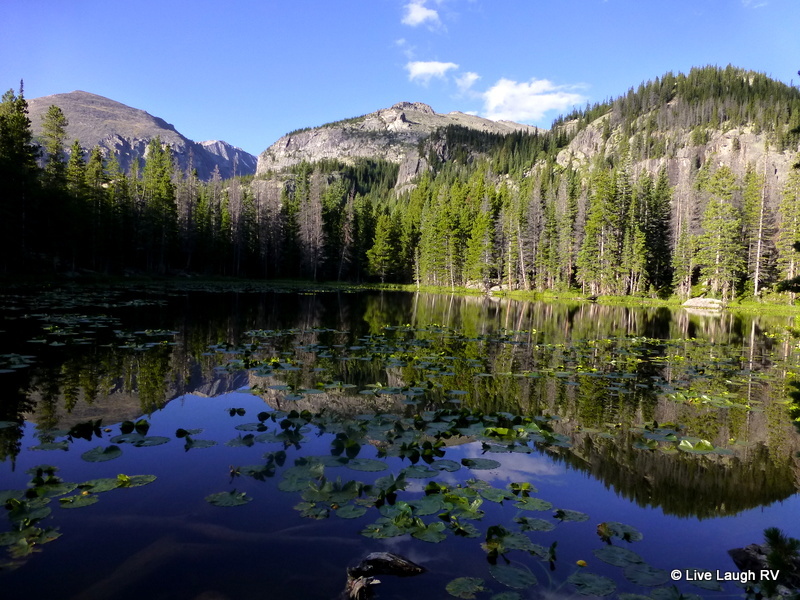 Rocky Mountain NP looks very beautiful…I think I need to add this park to my list. those photos of the deer are exquisite! they are usually so shy- was it taken with a really long lens? The Elk are really accustomed to people. That particular shot was at 400 mm but the other Elk shots were at 125 mm. Awfully since of them to be so accommodating! They usually aren’t but in RMNP they’re used to the crowds. Anywhere else and there’s no way I could get this close. What a fab campsite you got! 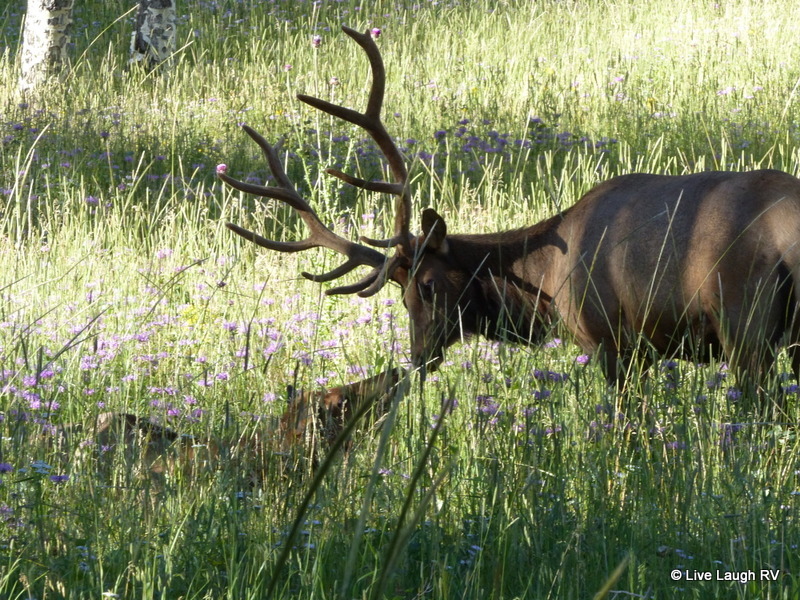 I love the detail you captured in the lily shot…and those elk! Beautiful! 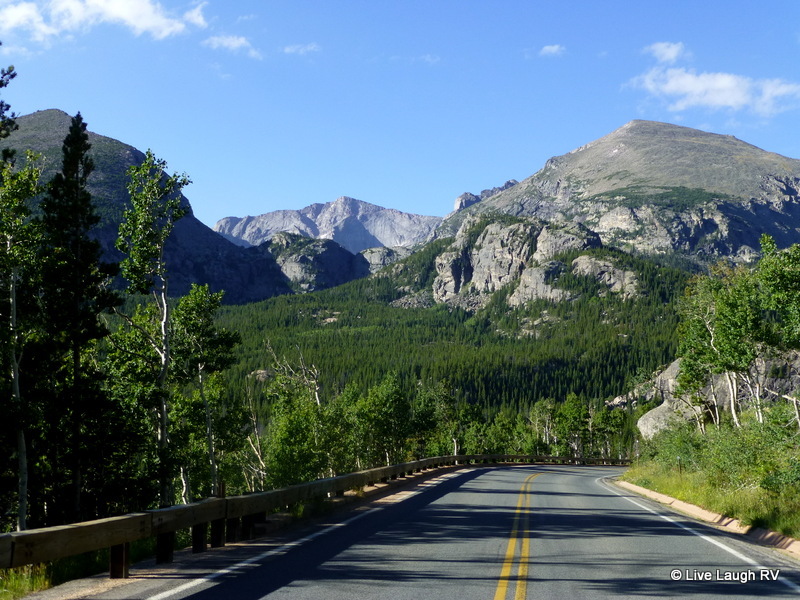 We stayed on the West side of RMNP last summer and the day we drove to the East side we were astounded by the crowds. I would love to visit at the end of Sept. I most definitely remember your stay in Grand Lake last year and will be using your blog for reference for next summer as we hope to spend a month in Grand Lake. 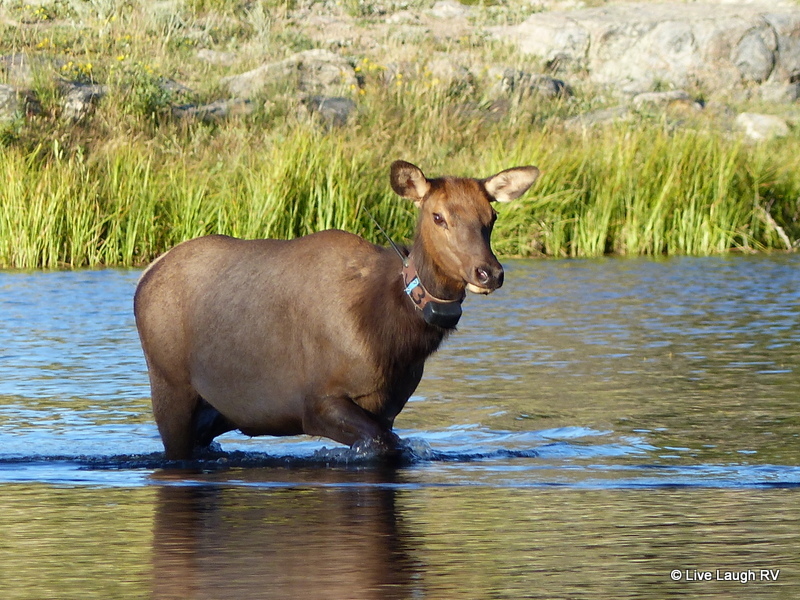 We were hoping to get back over to RMNP for the Elk rut starting around the 2nd or 3rd week in September, but our daughter may be moving and needs us nearby. Ah, you and your BFF would have a field day hiking at RMNP and remember it’s not all that different than driving from LV to Mt. Charleston. Perhaps a fall trip to Denver is NEEDED lol. Sounds like you chose wisely with you RV size. We can camp in some state parks and very few NP’s which I wish were different sometimes. We only spent one full day in RMNP but really enjoyed it. If it isn’t too long a drive to our next destination, we, too, will scout out the campground. Luckily, if I tell Paul we are doing something that is very popular, he is the one that says we better be there before the sun rises…and he isn’t kidding. The lake photo is awesome. We feel so much better arriving to a new campground KNOWING we’ll fit into our campsite. The internet works only so far and it’s definitely more reassuring having set our eyes on the place. I’m the one always pushing. There has to be one to push or we’d never get out of the RV LOL. What incredible wildlife photos Ingrid! The one of the adult and the baby nose to nose is stunning. In the first photo is the deer wearing a tracking collar? Oh thanks for clarifying Ingrid. Obviously my knowledge of wildlife is not great. Looking forward to other photos! Will also make note of your trailer info. We have a 27′ now, but hardly livable for a ‘forever home’. We’re looking at 40′, however we’ll be limited as you’ve said, on where we can set it. Just a thought…. you might want to consider 34′ – 36′. We know LOTs of folks with 40 footers that if they had it to do over again, would go shorter. We found a 34′ MH we fell in love with but the dealer wasn’t willing to deal 😦 So we’ll stick with our current rig a while as she’s working out pretty sweet anyway. Thanks for the great info. I just looked at our ‘dream 5th wheel’and it’s a long 44’. It’s not the first time I’ve heard to go a bit shorter. ..
Im so excited that we are actually going to make a mad dash trip up there this weekend! It is going to be fast and furious, for sure. We hope to mainly just make driving expeditions to the two parks and see some of Golden and Denver, if we can. I will try to brace hubby for the crowds, too. Been to Yosemite during summer months once, and it was wall to wall traffic in the valley. This is really the only time we can try to make our fact-finding trip, and I just hope at this point that it does not fall thru, as hubby just got a promotion and another department to manage that has… issues. We will also carry plenty of water along since those altitudes are definitely a big change for us. 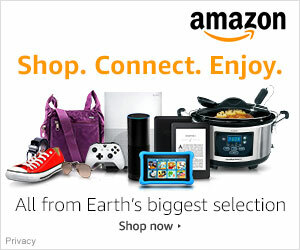 Thanks for your wonderful posts! If you have any recommendations on a nice, easier hiking trail near Estes Park and inside Golden Gate, that would be awesome, just in case we have time to do that. Restaurant recommendations are also welcome. Thank you. Appreciate the comment! I have very happy memories of our last visit there in 2010. Your beautiful photos have strengthened my resolve to go again in the near future. Well I’m sure glad you got there early…looking at these photos in awe! Just stunning! You definitely need to put this on your ‘must see’ list. The scenery is awe-inspiring and the wildlife is very special. Hang with me next summer and I’ll get ya broken in. Us Illinois gals gotta stick together LOL.